Consider that approximately 150,000 Wisconsin residents - - 26 of every 1,000 people in a state with a population of about 5.8 million - - and/or their supportive relatives - - could lose the deductibility of those costly medical expenses from their taxable federal income if Paul Ryan's version of the Republican Free Money for the Rich tax plan were to carry the day. Other people can find similar figures for the number of people who are caring for children or adult relatives with one or more emotionally and financially draining medical conditions - - from MS to ALS to Parkinson's to diabetes to Alzheimer's to cancers to autism, and so - - who would lose that deduction but win a faster ticket to bankruptcy if the Senate in negotiations accepts the loss of the medical deduction in Ryan's harsh bill. Maine GOP US Senator Susan Collins, saying 8.8 million Americans currently use the deduction - - half of whom earn $50,000 or less annually - - made sure the Senate version of the bill kept and actually increased the deduction's value. Remember that Ryan's House bill would delete the deduction altogether to help fund lop-sided tax breaks he wants showered on millionaires and GOP donors. All of whom can more easily afford their medical bills. 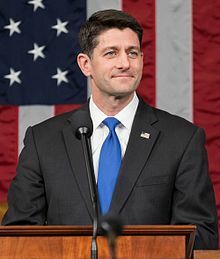 Voters in Ryan's district should make sure this 'win' is all his. I don't Ryan really gave the impacts of the tax plan much thought. He probably just did what the lobbyists told him to do. I don't think he is smart enough to look ahead and he certainly doesn't read the bills he pushes. He can't seem to answer questions beyond talking points. The GOPee is in the hands of a bunch of bible thumping Ayn Rand worshipping granny starvers. I think he knows exactly what he is doing. He does talking points because he doesn't want to say what he's really doing. I heard Ryan's comment on this deduction in his interview with Steve Inskeep. He claimed that most of the people who used the medical deduction were already well off anyway. So it didn't matter if they lost it, or some such hogwash. He is heartless. Most rich people can get insurance which makes it unlikely that they'll pay enough out-of-pocket to qualify for the deduction. But even worse than Ryan lyin' again, the subtext of that comment is "poorer people won't have the money to pay out of pocket." In other words, Ryan is OK with making it more likely that poorer people SUFFER AND DIE as long as his Koch paymasters get paid. I really should buy guillotine futures.